We don’t necessarily have to use artificial coloring to create beautifully colored Easter eggs. 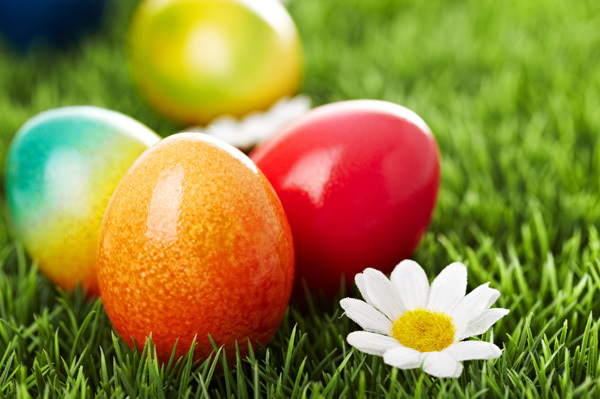 Vibrantly colored foods and spices such as beets, blueberries and ground paprika can serve as fantastic natural dye alternatives to use for this year’s Easter egg decorating tradition. It’s not hard to create naturally dyed Easter eggs. Any food that will stain your clothes or your hands probably will make for an effective eggshell dye. So have fun, get creative and try out a whole new Easter egg dyeing tradition — no artificial colors necessary. Hard-boil white eggs by placing them in a large pot and covering them with cold water. Bring the water to a boil, then turn off the heat, cover and let sit for 10 minutes. Strain the eggs and let them cool. Wipe the outside of the boiled eggs with white vinegar. This will help the egg absorb color. If you want to get extra-creative, try wrapping rubber bands around the eggs or affixing small stickers to the outside to create fun patterns. Immerse the eggs in the coloring liquid (see below for instructions and ideas for creating natural coloring). For more subtly dyed eggs, keep eggs immersed for 2 to 10 minutes. For a more vibrant hue, soak the eggs overnight. Remove the eggs from the coloring liquid when they have reached your desired level of color saturation. Allow them to dry completely before removing any stickers or bands. 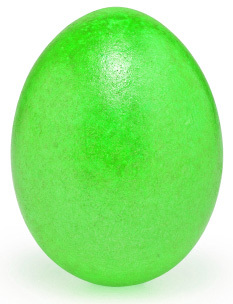 Naturally dyed eggs will have more of a matte finish than artificially colored eggs. If you want to create glossier eggs, use a cloth to lightly rub vegetable or mineral oil on the outside of the eggs. For purplish-blue eggs: Boil 1 head of red cabbage in 4 cups of water for 30 minutes. Strain the cabbage water into a bowl and soak the eggs. For brown eggs: Soak eggs in strong black coffee. For green eggs: Boil 4 loosely packed cups of spinach in 4 cups of water for 20 minutes. Strain the spinach water into a bowl and soak the eggs. For bluish-gray eggs: Boil 1 cup of blueberries in 4 cups of water for 10 minutes. Strain the blueberry water into a bowl and soak the eggs. For yellow eggs: Boil 2 tablespoons of turmeric powder in 4 cups of water until it is dissolved. Turn off the heat and soak the eggs. For orange eggs: Boil 2 tablespoons of paprika in 4 cups of water until it has dissolved. Turn off the heat and soak the eggs. For pink eggs: Boil 4 cups of chopped beets in 4 cups of water for 35 minutes. Strain the beet water into a bowl and soak the eggs.